The residents of the small town of Lugo, in the north central region of Emilia Romagna, take pride to this day in its former Jewish community and their cultural achievements, especially the exceptional decorated ketubbot produced there. Indeed, from the late seventeenth to the mid-nineteenth centu- ries, this provincial town became one of the leading centers of ketubbah illustration in Italy. Local Jewish artists developed a technique of making intricately cutout borders. This contract represents a practice distinctive to the Jews of Italy: the reuse of borders from earlier, beautifully decorated ketubbot. Unlike the example from Alessandria (cat. no.63), here the border created locally about a generation before the present couple reused it for their wedding in Lugo. As the opening word “On Wednesday” from the original ketubbah could not be removed without risk of damage to the decoration, and the second wedding took place on a Wednesday as well, this word appears twice. The entire external border is ornamented with a series of small cutout triangles and circles. The three circles along the top are shaped as delicate roses. Framing the text is an arch, supported by a pair of twisted columns with ornamental bases and floral capitals that are entirely formed from tiny cutouts. The arch encloses large cutout cartouches inscribed with a blessing typical of Lugo ketubbot: “Almighty, Bless us and we shall live[!]”. 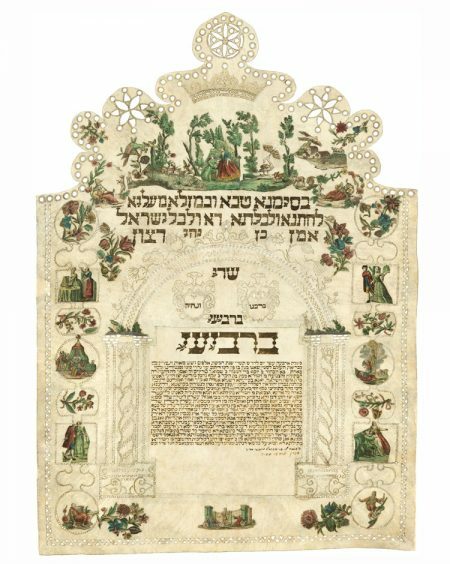 The external frame is filled with copper engravings that were cut from a contemporary printed non- Jewish source, which were then hand-colored, and glued to the parchment. Among the decoupage images are depictions of young couples in various activities. The largest one, at top center, portrays a pastoral scene with animals, a shepherd, a pond with geese, a butterfly, flowers and trees, men smoking pipes, and, in the center, a young man kneeling in front of a lovely young woman, seem- ingly requesting her hand in marriage. Three biblical episodes appear in the centers of the side and bottom borders: Jacob’s Ladder at the right, Delilah Cutting the Hair of Samson at the left, and Joseph in Prison Interpreting the Dreams of the Cupbearer and the Baker at the bottom. This rarely depicted scene of the wisdom of Joseph is a refer- ence to Joseph Treves, the bridegroom.